If you have ever wondered how a Horner’s syndrome could be associated with ipsilateral ataxia and contralateral alteration in temperature sensation? Or, why you should not be surprised to find a III nerve palsy, with a contralateral hemiparesis and loss of vibration sense? If you answered yes to these questions then you should read Peter Gates’ The Rule of 4 of the Brainstem (Int Med J 2005;263-266 – PDF). 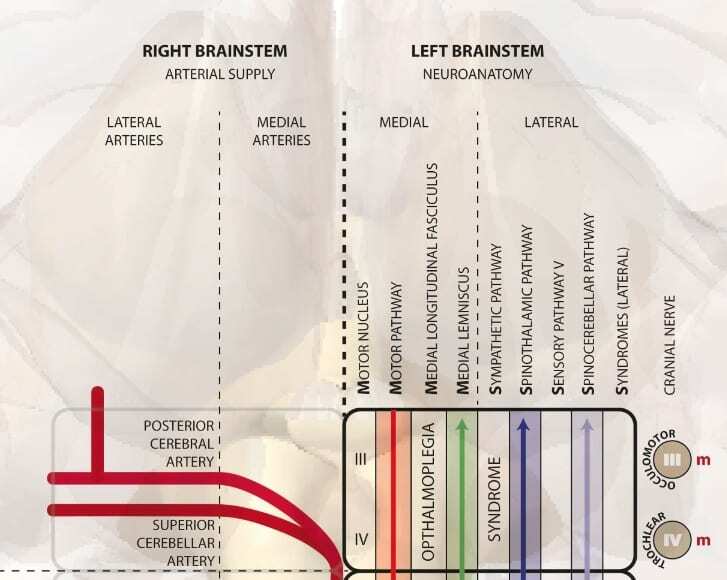 In this beautifully written paper, Gates devises a system of approaching clinical brainstem neuroanatomy in a series of 4 simple rules. It is elegant, by explaining only that which can be detected by a basic neurological examination, and it is practical, by offering a system that can be easily remembered. Whilst well written, the illustrations unfortunately did not reflect the simplicity of the text. Given the limitations of the images, I found myself having to rewrite the text into several tables in order to grasp the concept of the paper. It has been quite a few years now since my exams, but I promised myself then that I would revisit the paper and try to recreate an illustration that I would like to have seen in the original publication. To this endeavor, I had to re-discover the essence of what made the paper so good, and create an illustration, which contained each of those elements. 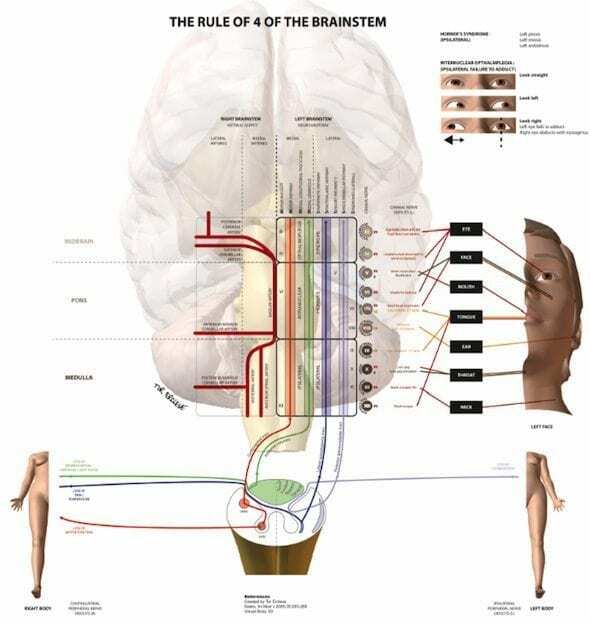 There are 4 columns in the ‘midline’ beginning with M.
Originally, I wanted to draw these lines of latitude (rules 1 and 2) and longitude (rules 3 and 4) directly onto a picture of the brainstem (see background image). Whilst this would have been more accurate, I opted rather to accentuate the principles of latitude and longitude by using a 3×9 grid. 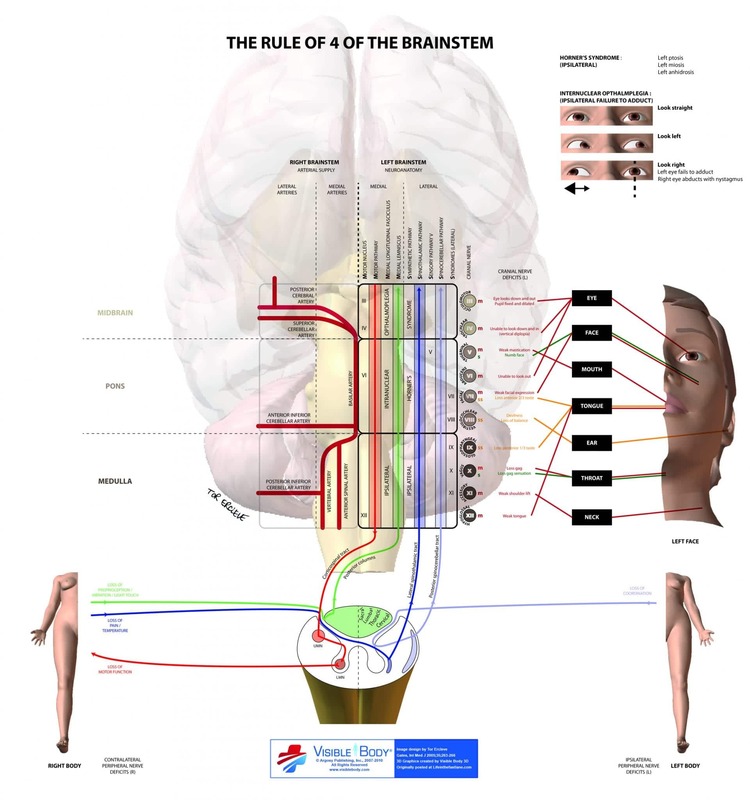 The 3 being the medulla, pons and midbrain, and the 9 being the 4 medial columns and the 4+1 lateral columns. Next, I noticed that there were 4 columns that were in fact related to spinal tracts. Would it not be helpful to show that the medial lemniscus is the continuation of the posterior column, or that the spinothalamic pathway is in fact an extension of the lateral spinothalamic tract? Prior knowledge of spinal cord lesions would then facilitate an understanding of the brainstem pathology. It would also highlight why most clinical findings are contralateral to the cranial nerve lesion. This leads us to the next aspect of the paper, the bringing together of form (neuroanatomy) and function (clinical findings). The illustration would have to show the clinical finding, for any given lesion on the grid. The image would have to include one side of the face and both sides of the body. For simplicity, I decided to concentrate on what you would expect to find, for a left sided brainstem lesion. Also, there were 2 columns, one medial and one lateral, which stuck out like a sore thumb. The medial longitudinal fasciculus and the (lateral) sympathetic pathway would require a separate note (top right) to illustrate the clinic findings of a Horner’s syndrome and internuclear opthalmoplegia. The rule of 4 does not just link neuroanatomical lesions to clinical signs, but also identifies the underlying vascular lesion causing them. 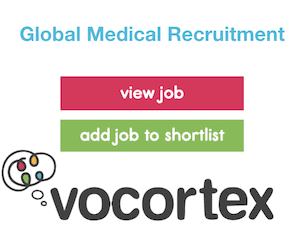 The illustration would have to include a partial Circle of Willis divided into 6 vascular areas. It is a known truth, that if you were to use the tube map of London to help navigate your walk from Paddington to Piccadilly Circus, you had better bring a compass, a packed lunch and camping gear. The tube map sacrifices geographical accuracy for coherent simplicity. Many more commuter hours were saved in providing a quick route planner, than there were wasted in encouraging commuters to wait for the next train from Leicester Square to Covent Garden. I hope I have done this paper justice in providing such a route planner of the brainstem. If only the London Underground could be as straightforward as clinical neuroanatomy. The illustration was created using Visible Body 3D, Adobe Illustrator and Adobe Photoshop for a neurology workshop at UWA. I would like to thank Dr P Gates for making brainstem anatomy accessible to us mere mortals. Perhaps he would next like to venture into the realms of the glomerulonephritides?